Like any matter, Di Suvero's sculptures do what physical laws allow them to do. They are manipulated so that they will stand up and their various parts will balance. These are limitations, I suppose, but they also involve a recognition and celebration of the possibilities of the physical universe. 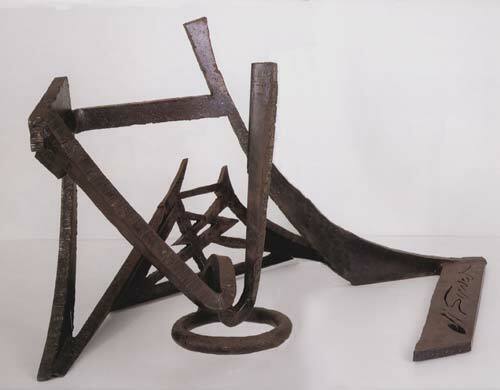 Physicality is extremely important to Di Suvero, emphasized in the material itself, in the way parts are joined together, in the insistently evolving three-dimensionality of his constructions. But the presence and meaning of his work extend beyond physical law, or perhaps physical law extends beyond itself, something that by its very nature cannot be known. The sixteen works that were in the exhibition are within human scale, not literally but as they were raised up on pedestals so that one could see them at or slightly below eye level. Some might be heavier than humans, some not. It's hard to tell because they are made mostly of steel, although one could figure it out (without weighing them) based on the amount of steel used and knowing the weight of steel. But it wouldn't really matter, any more than it matters for us about our own weight. Of course, it does matter in that there is a correct mass that can be balanced, eccentric as the mass might be. Having come into being, these figures exist in unexpected complexity, products of their making, of having been cut and twisted from base matter. In this latter work, and in the entire series of "Women" paintings and drawings he did from 1947 through the mid-1950s, de Kooning established a very strong connection to Picasso and Cubism, particularly to Picasso's Les Demoiselles d'Avignon of 1907 and Guernica of 1937. De Kooning was, in a sense, rescuing the force and freedom of modern painting, partly from the presumed certainties of Mondrian and Constructivism and partly from the depredations of authoritarian government and world war. It is a curious and powerful evocation, or reemergence, dependent on the original but not at all like it. There is still the sense in Cubism that things do fit together in time and space despite their fragmentation. De Kooning, on the other hand, confronts an absolutely incongruous world in which wholeness resides, and this itself is uncertain, only in the vision of the artist. Every time he apprehends something, he, or it, bumps into something else. 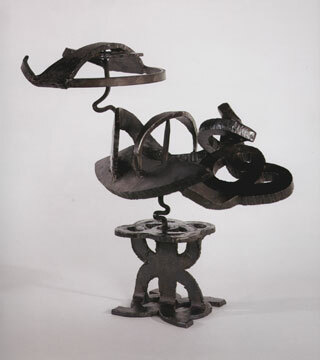 The smaller sculptures, such as those in the show, are consciousness (and conscience). Simplistically, no doubt, each is a figure, a body and a brain, a trunk and branches, or, grandly, earth and cosmos. In most of them, at least in those done since the late 1960s, the convolutions of the upper part are poised on the point of a rod rising from a level base (in some there is a second point of balance). The upper part can be moved and thereby changed in relation to the stable lower part, inducing the possibility of a constant flow of energy, all within the configuration. The base is the given, perhaps, with its own pattern, the moving upper part is the speculative; one is fact, the other process. These are not objects of contemplation, as one expects a work of art to be; they are contemplation. They require response and involvement. One is forced into them, to admit their structure and motives, to act with them. They create a language that must be used, ultimately into a larger context. 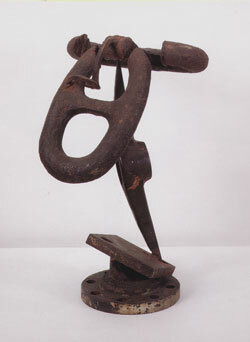 Sometimes the language is keyed by immediately recognizable symbols, as for instance in Freedom Now of 1967 (in this show), broken chain links are balanced on the point of an upright pick-axe. Eatherley's Lamp of 1961 has a hanging canopy of fiberglass that suggests the mushroom cloud of the atomic bomb that Col. Eatherley and his crew dropped on Hiroshima in 1945, and Mother Peace, an outdoor work of 1970, has a horizontal girder with a cutout of the peace symbol (neither of these latter two is in the show). The references are direct and unmistakable--to the civil rights struggle, the illumination of collective guilt, the protest against war--and essential to the force and meaning of the works. It is impossible to consider these works without recognizing their underlying "subjects." The symbols or images in these cases trigger a specific phenomenon and set of associations raising inescapable political and ethical issues. In other works, particularly those of the 1980s and '90s such as Santenay (1988), A Sign in the Desert (1989), and Rigel (1992), the symbols seem less specific and yet their cognitive and existential implications and complications are no less inescapable. Recognizable symbols, such as those presented by language, are simply means, given and evolved, to begin sensing where one is in the universe. That is how these pieces, like poetry and music, function as engines of thought, how they concretize the synapses, and even at times look like, our brains. 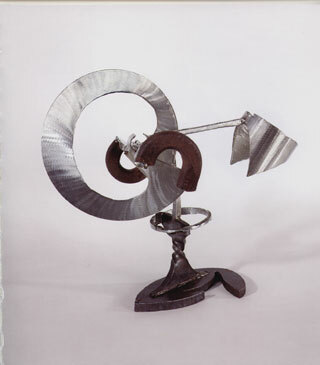 The exhibition was on view at Danese Gallery, 41 East 57th Street, New York, NY 10022.